Location: Passing through Malanda on the main road, approximately two (2) Kilometres from the town centre, on the left hand side of the road.. The Environmental Information Centre gives an interpretative, interactive and informative account of the geological history of the tableland area, interesting any visitors to the falls. The display is presented in simple terms with rock and rainforest specimens, models and pictures to look at accompanied with information of the area to read. The Visitors centre also offers a range of local brochures and a volunteer worker is usually available to answer any queries you may have. 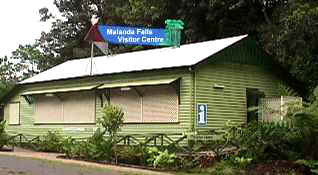 A fifty (50) metre walk will take you from the Environmental Information Centre to the Malanda Waterfall. Across the road from the Environmental Centre is a short rainforest walk that will offer you some magnificent photo opportunities. Close to its beginning is a platypus, turtle and lizard-viewing platform that, with any luck will allow you to see some of the animals Malandas rainforest holds. Take an hour long Guided Aboriginal Rainforest Walk from the Malanda Falls Environmental Information Centre and see unique, ancient and original upland rainforest through the eyes of a Ngadjonji tribal elder, Ernie Raymont.